Microtech Environmental Services Corp. offers safe and meticulous “in situ” (on-site) and “ex situ” (off site) cleanup of infectious disease. Once the type of infectious disease and pathogenicity (capacity to cause disease) is determined, we cleanup, disinfect, bag (double), track, and remove them. We insure this process runs smoothly and can arrange safe disposal. Our methods can include chemical leaching and extraction, vaporization, pressurized water rinse with steam and air jets, scrubbing, scraping, neutralization, and dry heat, gas, vapor, fogging, foaming, steam sterilization, UV Disinfecting System (UV-C blue ultra-violet light). Since 1992, Microtech has become the leader in cleaning up hazardous material. Our staff has specialized training specifically for infection control (e.g. 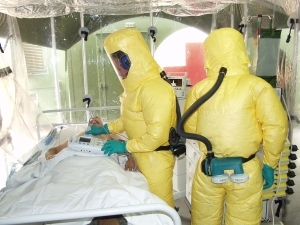 “Cleaning Biological Contamination in the age of Ebola”, “OSHA Bloodborne Pathogens 29 CFR 1910.1030”, etc.). The CDC reports there are 3.2 million outpatient hospital visits for infectious diseases and parasitic diseases per year. Ebola Clean-up (steps below) can be applied to most Infectious Diseases. A brief overview of the preparation, cleaning, removing, and maintenance involved in cleaning up the virus (pathogens) found in biomedical waste is below. Below is the preparation before the cleaning and decontamination is done. Proper repeated training and demonstrated competency is extremely important. Isolating the area is important to minimize the spread of the Ebola virus. Physical barriers such as plastic enclosures with proper signage are set up to separate the clean and potentially contaminated areas. Remove personal clothing, jewelry, watches, pens, papers, cell phones, etc. Change into disposable garments | scrubs and dedicated washable footwear (plastic or rubber). Hands are washed and air dried. Alcohol-based hand rub (ABHR) must be used to disinfect. Personal protective equipment (PPE) must be worn and placed on the body in the order below. The equipment must be fluid-resistant or fluid impermeable. No skin should be exposed. Disinfect outer gloved hands and air dry. A trained observer is recommended. Immediately clean and disinfect any surface that has been contaminated by the Ebola virus. All body fluids and parts must be cleaned up, contained / bagged, removed, and disposed of properly. Frequent disinfection of gloved hands is recommended throughout the process below. Routine frequent decontamination maintenance of the Class III cabinet, HEPA filtration, hospital, lab, equipment, HVAC, etc. is necessary for maintaining a safe environment. High temperature, pressurized, steam cleaning (autoclave) can damage some equipment; the alternatives would be gaseous and vapor methods. Your environment and IAQ (Indoor Air Quality) is restored. Each step outlined is meant only for a quick synopsis. For more detail to each step, please visit the Center for Disease Control and Prevention, CDC.gov. Pathogen is the microbe or harmful biological organism. The Pathogen causes the Infectious Disease in the right environment. Pathogen can be a virus, bacteria, fungi, prion, viroid or parasite (e.g. protozoa). They could live in and on our body. Infectious Disease is the disorder itself. Infectious Disease is the problem created by the Pathogen (microbe/organism). Eating contaminated food or water and exchanging bodily fluids can bring on the disease between people, insects, animals. Infection is when the bacteria, virus, or microbe enters your body and begin to multiply. Disease occurs when your cells become damaged. Cleanup and eliminating the communicable, infectious disease is what we do. We can track and coordinate the transportation of the Biomedical and Medical Waste Disposal as well. Medical symptoms can range from fever, gastrointestinal, vomiting, respiratory, fatigue to death depending on the infectious disease. During our cleanup, we find and cleanup medical waste as well. We properly place these items into a biohazard bag and container ready to be carted away. Decomposing body (decom): Blood (serum, plasma, etc. ), Body parts (organs, tissue, bones, skin, appendages, etc. ), and Bodily fluids (saliva, breast milk, vomit, tears, sweat, nasal secretions, sputum, urine, feces, etc.). Sharps: Contaminated injection devices, hypodermic needles, syringes, broken contaminated laboratory glass, scalpels, lancets, spiral needles, suture needle, surgical instruments, droppers, pastuer pipettes, transfer pipettes, serological pipettes, pastettes, culture tubes, culture flasks, dental anesthetic carpules, etc. Other: Anything that has come in contact with blood such as medical supplies (bandages, dressings, etc. ), bedding, etc. Infectious Disease is also known as Nosocomial Infection (HAI or hospital acquired infections are also called nosocomial disease), Biomedical Waste (BMW, a subset of Biowaste), Medical Waste, Biohazardous Waste, and Regulated Medical Waste (RMW, which includes Pathological and Chemotherapy as well). Infection Control is also called Hospital Infection Control, Ebola Control, Infectious Disease Control, Nosocomial Infection Control, Healthcare-Associated Infection Remediation, Infectious Waste Removal. Locations of Infectious Diseases: Hospitals, Medical Facilities, Medical Research Facilities, Clinics, Nursing Homes, Home Health Care, Physician’s offices (medical, dental, veterinary), Dialysis Centers, Ambulances, Nursing Homes, Assisted Living Facilities, Funeral Homes, Pharmacies, Crime Scenes, Laboratories (i.e. Medical Research, Clinical, Public Health, Industrial, and Illegal Drug), School Gyms, Daycare Facilities, Law Enforcement (Squad Cars, Jails, Holding Cells), Cruise Ships, Airplanes, Public Transportation (Mass Transit) are a few of the places you’d find them. Ebola Virus Disease (EVD) or Ebola Hemorrhagic Fever (EHF) is spread through direct contact with an infected person or contaminated objects. Touching broken skin, mucus membranes (eye, nose, mouth, etc. ), body fluids (blood, etc. ), or contaminated objects (needle, syringe, lab specimen, etc.) are ways to transmit the disease. General contractors, building owners, superintendents, realtors and project managers depend on Microtech's expertise. Specialists in industrial and commercial businesses, historical landmark sites, government buildings, schools, universities, hospitals, medical facilities, laboratories, hotels, motels, retail stores, religious institutions and more. Emergency Services: Life threatening or IDLH (Immediately Dangerous to Life or Health) requires notification to “911” first. Under special circumstances, evening & weekend cleaning hours are available.